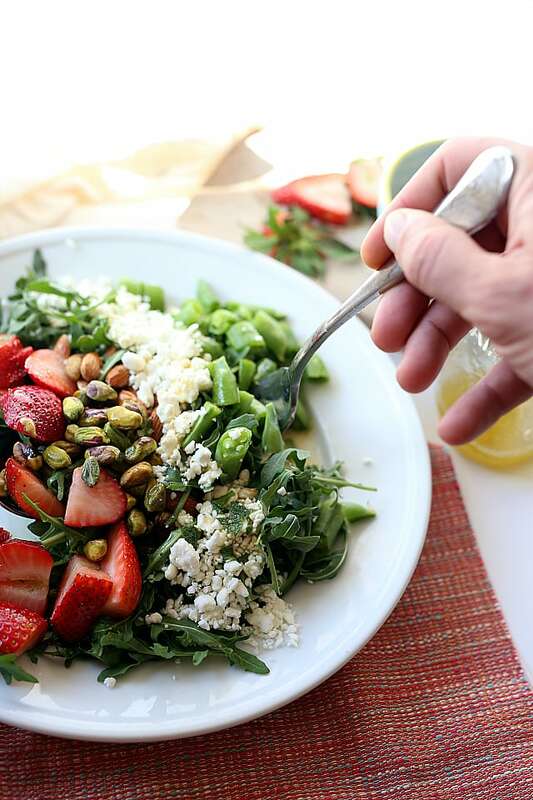 The most delicious 10-minute arugula salad with strawberries and feta layered with crunchy almonds, pistachios and snap peas tossed in a sweet orange poppy seed salad dressing. A must make strawberry salad anytime of the year! How’s your week going, friends? I am loving the warmer weather here in Santa Barbara; not so much the daily fog that has rolled in but overall it is pretty much always fantastic. No fog will ruin my positive vibes each day! It sure helps to have good vibes exultant thanks to day light savings and it being brighter out longer! My kids kinda sleep in now –Whoot! Whoot! A couple of weeks ago the boys and I went to two of our favorite (localish) farms, Walnut Lane and Folded Hills (north of Santa Barbara). We usually get all of our produce for the week there if we miss the Farmer’s Market. Walnut Lane has started to sell their fresh grown strawberries and boy are they mouthwatering, juicy and sweet! Folded Hills was telling us that their strawberries will be ready for picking next month. I am so excited for fresh picked strawberries and the recipes to come! More than that it brings joy to watch the boys reach low, pick and gather fruits then come home and make a delicious meal with me like this arugula salad with strawberries. 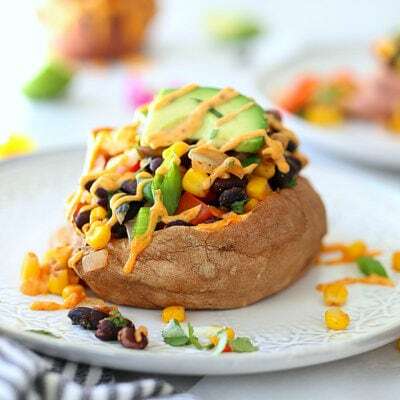 Kids are picky and some days they eat salads and some days they don’t but if we make it together they tend to pick at the ingredients and learn the importance of eating clean, real foods. Rich green Arugula leaves happen to be high in vitamin C with less iron than spinach. It is one of the green leafy vegetables that I can eat since I have to keep an eye on my iron intake (so I love them!). Strawberries are high in vitamin C, antioxidants, magnesium, folate and potassium. If you have a green thumb and are looking to grow your own strawberries, you can get great tips here. Feta cheese and almonds provide vegetarian protein and pistachios aid in naturally reducing stress levels. 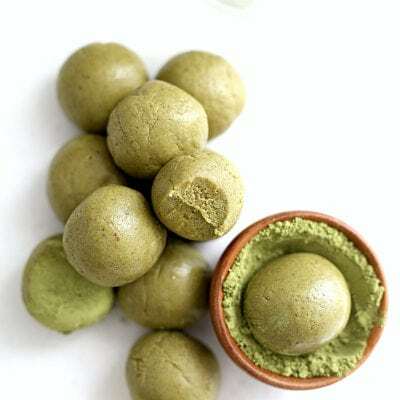 Notice when the seasons change your taste buds flow with it? 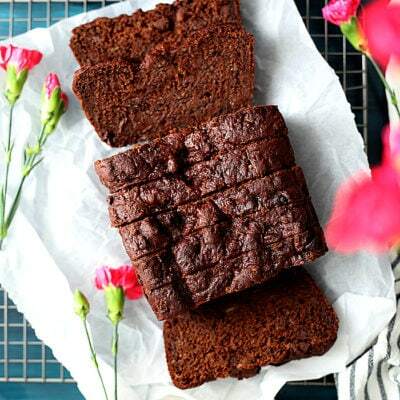 You suddenly start to crave watermelon in the summer and fresh berries as the weather warms up, or squash in the winter as it gets cooler outside. I know strawberries are not quite in season for a couple of months (summer fruit), but our family pretty much enjoys them anytime of the year. The hubby prefers strawberries plain, in cake or topped with whipped cream. He has not yet grown to admire a salad with fruit in it. Although there is something quite spectacular to be said about bitter/tangy arugula leaves complimented with sweet strawberries and not to mention the dressing! Favorite ways to eat strawberries are topped over Greek yogurt with homemade granola, in smoothies, pies and in salads. 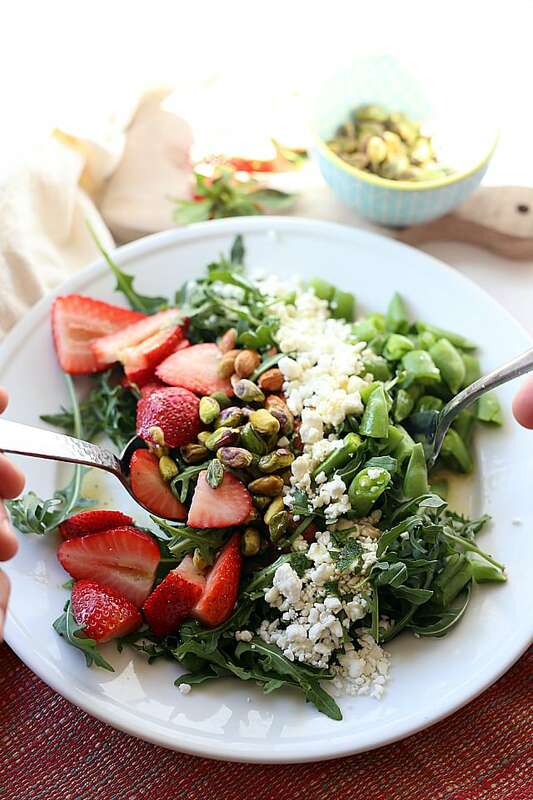 This arugula salad with strawberries and feta can be adjusted to whatever vegetables are in your refrigerator. 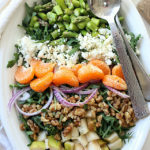 Instead of snap peas add carrot shavings or asparagus. 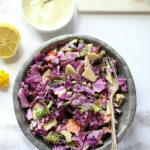 Don’t forget the main part – this orange poppy seed dressing which we made with oranges blossoming in our yard! 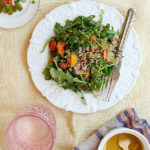 Orange poppyseed dressing is so simple and is best with fresh oranges or orange juice. Anything is better fresh! 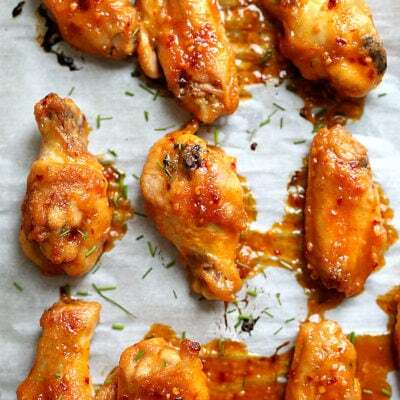 Simply whisk together lemon, orange juice, poppy seed, oil, mustard, honey salt and pepper and olive oil for the most savory dressing that can also be used as a marinade for chicken. 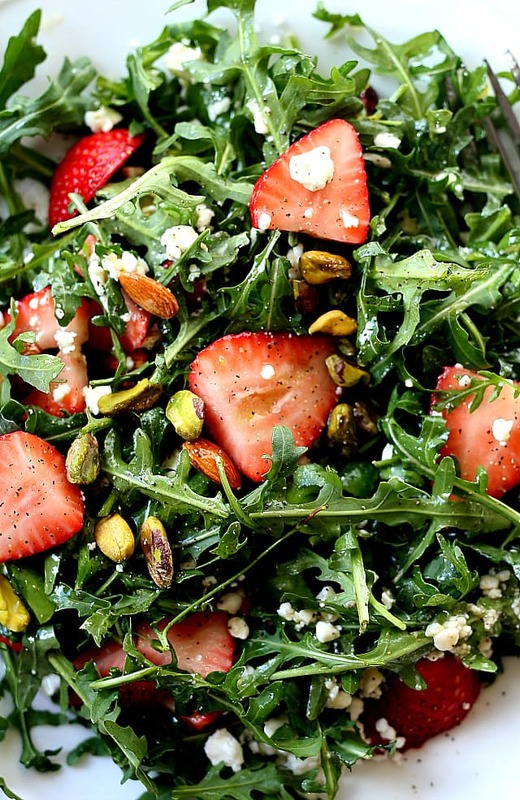 Arugula salad with strawberries is a favorite summer salad to bring you crunch, sweet and tangy flavors into one delicious meal! Strawberry salads are also quite popular served as a side salad, with crispy fresh garlic bread or add grilled salmon or chicken on top! 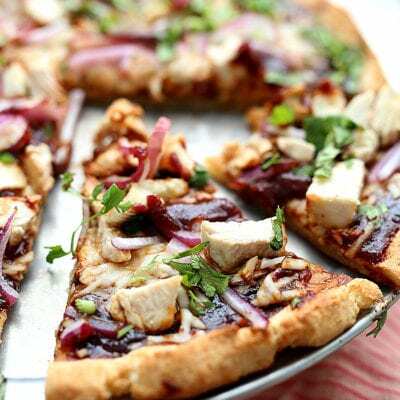 Use the dressing also as a marinaded for chicken. 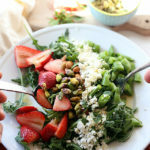 The most delicious 15-minute arugula salad with strawberries and feta layered with crunchy almonds, pistachios and snap peas tossed in a sweet orange poppy-seed salad dressing. 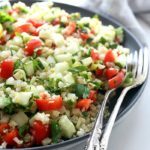 A must make strawberry salad anytime of the year! 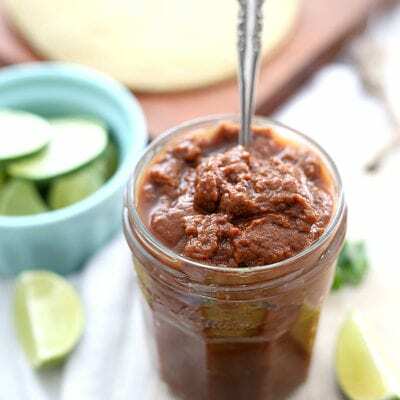 Using a mason jar or cup add all the dressing ingredients and whisk well. Set aside. 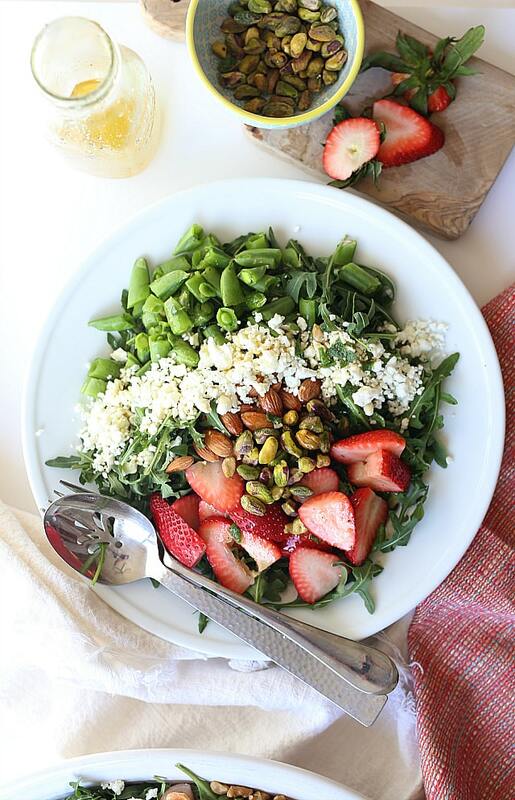 In a large bowl layer the arugula, snap peas, strawberries, feta cheese, almonds and pistachios. Drizzle with your orange poppyseed salad dressing the desired amount (start with half and add more if needed). Serve on 2-4 plates.